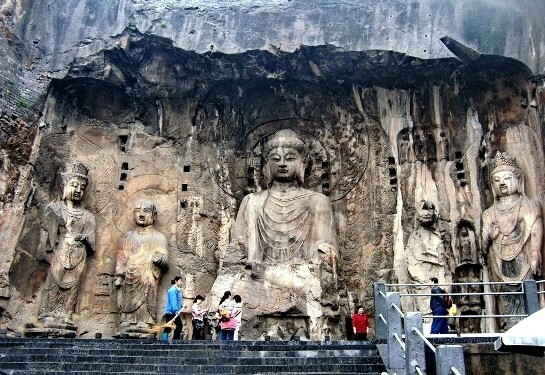 The Longmen Grottoes (龙门石窟), located near Luoyang, Henan Province, are a treasure house of ancient Buddhist cave art. The grottos were hewed and carved during the Northern Wei Dynasty (386-534), when the rulers relocated their capital to Luoyang near the end of the 5th century. The construction of the Longmen Grottoes began in 493 during the reign of Emperor Xiaowen and continued through the next six dynasties, including the Tang and Song, for more than 400 years. Altogether there are 1,352 caves, 785 niches, more than 97,000 statues of the Buddha, bodhisattvas and arhats, and 3,680 inscribed stone tablets along the 1-kilometer-long cliff of Mt. Longmen on the west and Mt. Xiangshan on the east of the Yihe River. The style of sculptures, the design of clothing and the facial expressions on the statues, as well as the carving methods, show little foreign influence. Rather, they exhibit the pinnacle of development of Chinese grotto art. The best time to see them is in autumn or during the annual Luoyang Peony Festival in April.